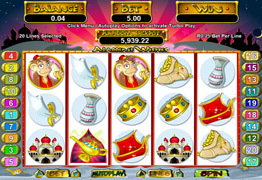 Read our Achilles Slot review and see screenshots of Achilles which is an RTG slot game with 2 bonus features. Find out which RTG casinos offer Achilles slot. Rub the Magical Lantern for Good Luck and Money! 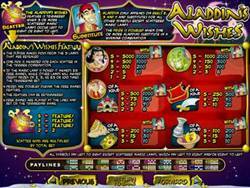 Aladdins Wishes Slot - A magical bonus rich slot from RTG. Aladdins Wishes has magical lamps, green genies, palaces, money bags and more. Rub the magical lamp and get lucky! The Aladdins Wishes bonus feature is triggered when 3 or more magical lamps appear on the left or the right of the screen. You then get to choose lamps for cash amounts from 2x to 100x the originalbet. if you are lucky and choose the lamp with the magical genie hidden in it, then you will be awarded 25 bonus spins at 2x multiplier. The feature can be retriggered over and over.